The spring of 1775 was a confusing time, especially for fourteen-year-old Andrew Beckett. His plan to attend Harvard College to prepare to study medicine with his mentor, Dr. Ammi Cutter, has been shattered by the troop build up in Cambridge, Massachusetts. And, life in his hometown of Portsmouth, New Hampshire, is becoming more dangerous by the day. Colonel John Stark, in charge of the troops from New Hampshire, requests medical supplies from Dr. Cutter. The doctor sends Andrew to deliver them, embroiling him in the battles of Chelsea Creek and Bunker Hill. "Fortunately for readers, Terri DeMitchell's historical fiction hews close to historical fact and the author has a flair for capturing the feel of the troubled times. Her novels are informative, enjoyable and thought provoking." 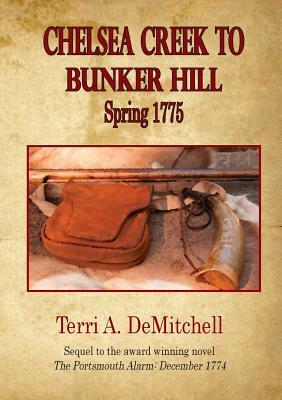 -Thomas F. Kehr, Esq., Past President and Historian, New Hampshire Society of the Sons of the American Revolution "Chelsea Creek to Bunker Hill: Spring 1775 is children's historical fiction at its best...a powerful saga of the legacy of battle and the concerns of those who became mired in the struggle." -D. Donovan, Senior Reviewer, Midwest Book Review. troubled times. Her novels are informative, enjoyable and thought provoking."